Whether it's a new diet, or kicking a nasty habit, sometimes willpower is hard to find. Wear this progress pendant to promote your ability to make positive strides toward your goals. Tackle your problems and achieve the impossible. A little will goes a long way. 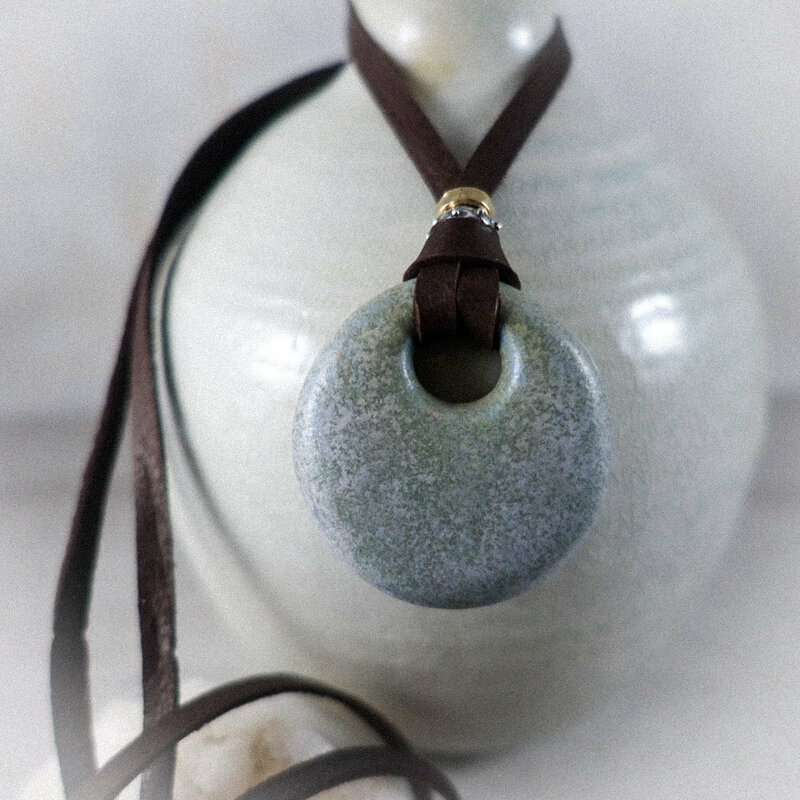 Hand crafted, ceramic pendant in a periwinkle glaze on chocolate brown leather. These are user friendly, no clasp needed. Simply slide the closure for your desired comfort length. Layer it with other pieces or let it stand alone. She’s good like that. Featuring a sterling silver and bronze bead. Priced at $58. 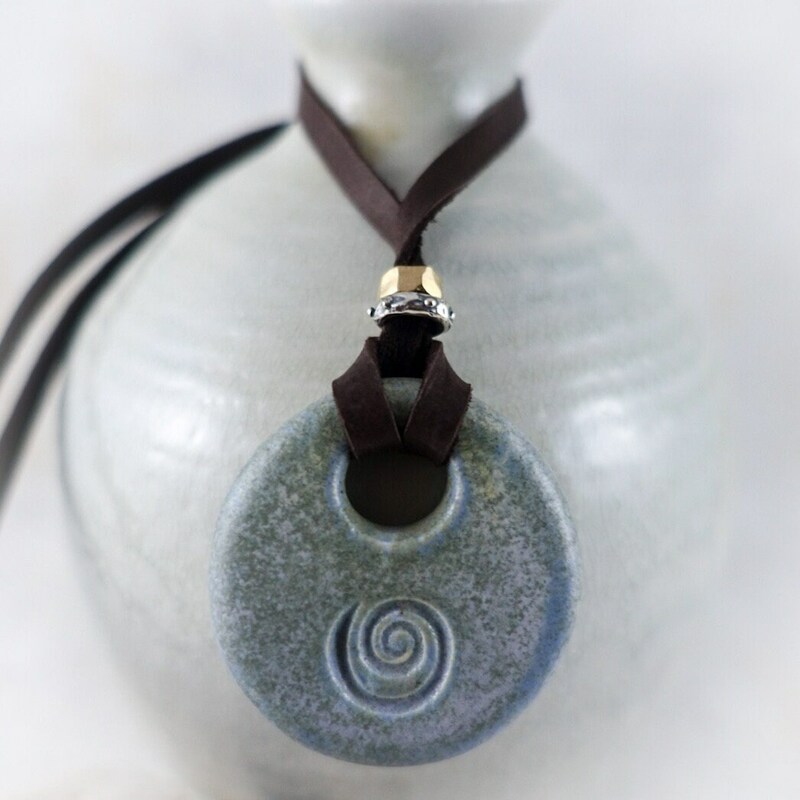 In the middle of your progress pendant is a small, embossed swirl. This symbol is a naturally occurring, nature-made image that can be seen in seashells, leaves, the human ear, space constellations, in flowers, in major storms, and in many other natural instances. Often referred to as the golden mean or the golden ratio, the shape created is said to bring about both balance and progress, encouraging the wearer to find direction and development in all of their endeavors. By expanding your horizons and allowing you to make more confident and meaningful connections to others, your progress pendant will guide you to living a more fulfilling life full of self-recognition and belief that you can do anything you set your mind and heart to.